What does it cost to stay on Mumbo and Domwe? All above prices are per adult per night (no single supplements apply). Prices are available for children and teens – please see the Info Pack for details. Prices include three meals per day, all activities and equipment, all taxes and National Park fees. Also included are purified water, and bottomless cups of tea, coffee and cooldrink. Prices exclude alcoholic and bottled drinks, SCUBA diving and sailing. All above prices are on a self-catered basis – please see the Info Pack for details on the various meal options. Prices include all taxes and National Park fees. Also included is purified water. Just like a pizza menu – choose from these recommendations, or make up your own! Just like a pizza menu – choose one of our recommendations below, or make up your own. Options include: getting yourself there; adding or removing nights; changing the mix of places to stay; saving some cash by self-catering and/or using your own tent on Domwe Island; adding in some SCUBA diving; adding on other destinations in Malawi. Any package pricing will still apply! Contact our Cape Town booking office for expert and one-stop service to get you there hassle-free! On Mumbo Island barefoot luxury is the theme; there is everything you need and nothing that you don’t. The camp is built using only reeds, timber, thatch and canvas and the emphasis is on the beauty provided by Mother Nature. The rooms are perched on high rocks overlooking the water and blend in with the African bush to create a ‘Robinson Crusoe’ atmosphere of rustic charm. On the island your time is your own – let the gentle rhythms of lake and island restore your sense of peace. Domwe Island Adventure Camp is basic but exclusive. The camp lies behind a small beach on the west side of this magnificent and wild island, offering sunset views over the lake with Mumbo Island and the mountainous edge of the African Rift Valley in the distance. Eight kilometres of open water separates Mumbo Island from Domwe. On Mumbo Island barefoot luxury is the theme; there is everything you need and nothing that you don’t. The camp is perched on high rocks overlooking the water and blends in with the African bush to create a ‘Robinson Crusoe’ atmosphere of rustic charm. Unique, beautiful, safe and friendly, the Lake Malawi National Park offers the kind of holiday where relaxation and comfort go hand-in-hand with a spirit of adventure. Six nights ex Johannesburg for R17 850 (valid to 31 July 2019.) 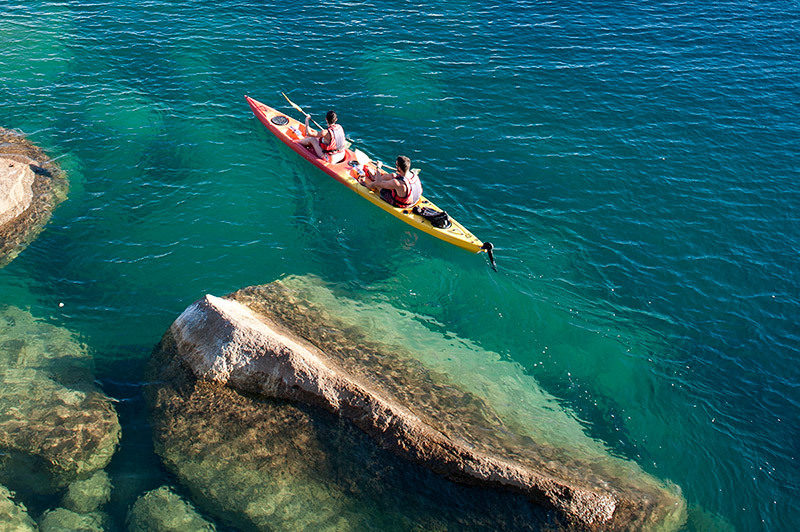 Pack the bare minimum in a kayak and paddle off to a deserted tropical island. This itinerary to Domwe Island is ideal for self-sufficient, active and nature-loving guests looking to rediscover the simple life of times gone by. The camp on Domwe Island is basic but exclusive. It is built using only reeds, timber, thatch and canvas, with the emphasis on the beauty provided by Mother Nature. The camp lies behind a small beach on the west side of the island, offering sunset views over the lake with Mumbo Island and the mountainous edge of the African Rift Valley in the distance. Domwe Island is run on a self-catered basis with guests making use of the camp kitchen to prepare their own meals. The kitchen is fully-equipped with stove, fridge, pots and pans, crockery and cutlery, and is kept shipshape by two full-time staff members. All you need to bring is food. 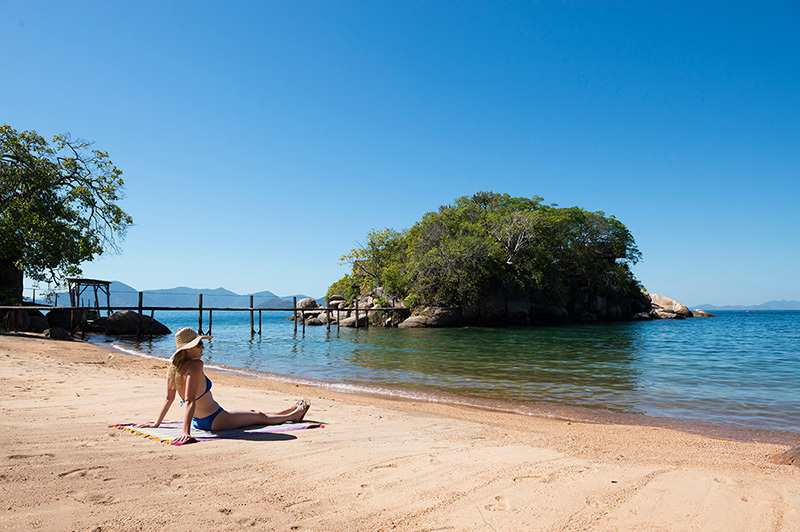 Before heading out to Domwe Island, the first two nights are spent at Mgoza Lodge on the beach at Cape Maclear. At Mgoza the emphasis is on chilling. 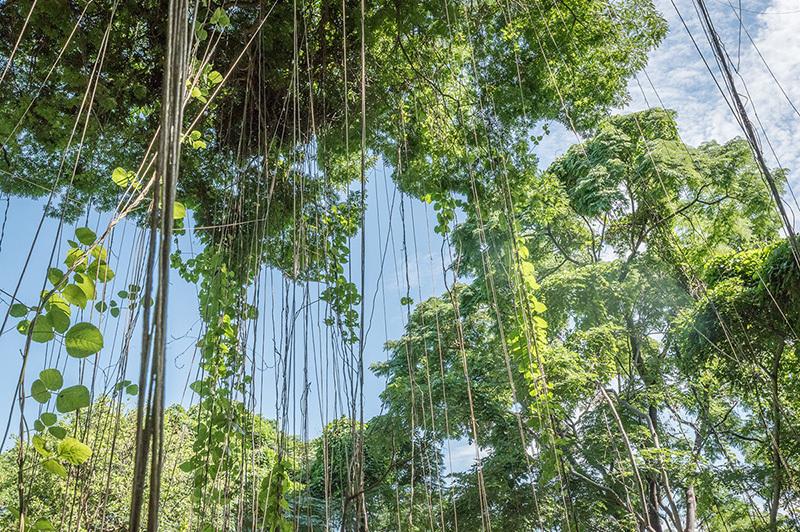 You can stay right here and enjoy a beer and meal in the open-air restaurant, or you can wander along the Cape Maclear beach strip checking out the myriad curio stalls, bars and restaurants. Also a great opportunity to stock up on local produce for your island adventure. A Bush and Beach combination in the cradle of the African Rift Valley. Perhaps this is the Garden of Eden? Habitat variety is awesome – massive lakes, mighty rivers, floodplains, riverine forests and vast natural woodlands combine to support all the big game and hundreds of bird species. 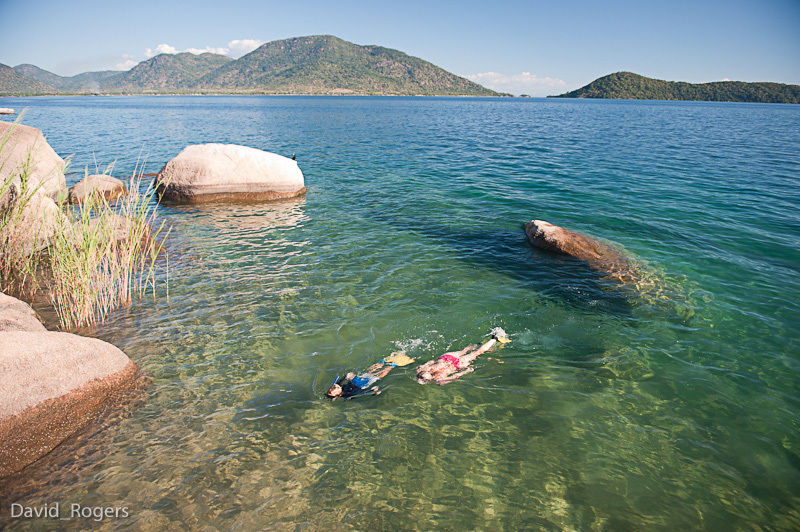 The Lake Malawi National Park is a World Heritage Site and the first freshwater marine reserve on earth. Its jewel – Mumbo Island – offers barefoot luxury in a camp that is both comfortable yet rustic. The island is located within an exclusive concession area, guaranteeing privacy in paradise. 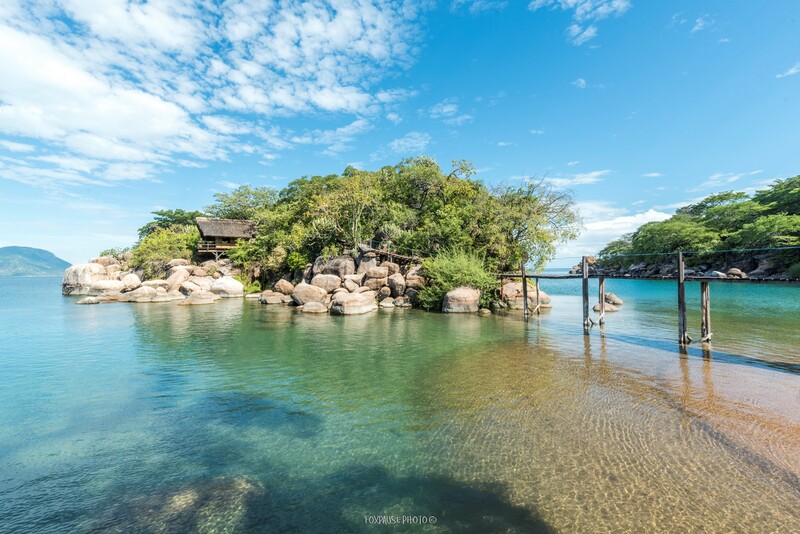 Surrounding the island the warm, fresh waters of Lake Malawi are home to massive jumbles of underwater boulders and myriad tropical fish, creating a magical swimming pool and the opportunity to try sea kayaking, snorkeling and SCUBA diving in a beautiful and friendly environment. Mvuu Camp is situated on the banks of the Shire River in the Liwonde National Park, Malawi’s premier wildlife reserve. Mvuu offers game drives, boat trips on the Shire River (which boasts Africa’s densest hippo and crocodile population), and game walks which can include tracking black rhino as part of the Big Five re-introduction programme. The National Park showcases incredible floral diversity, and some of the best bird watching in Southern Africa (record of 266 species in two days). Is the ‘Go go go’ of city life starting to get your goat? 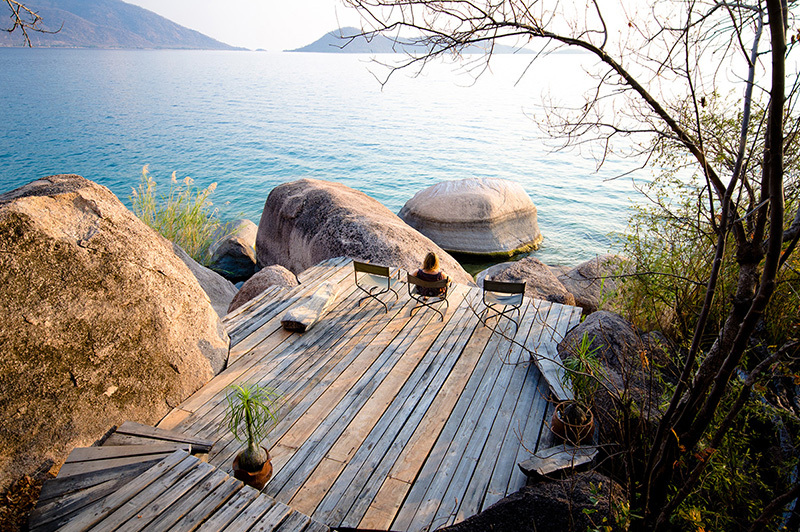 Help is at hand with this Lake Malawi classic which combines Malawi’s premier beach resort with its best island lodge. 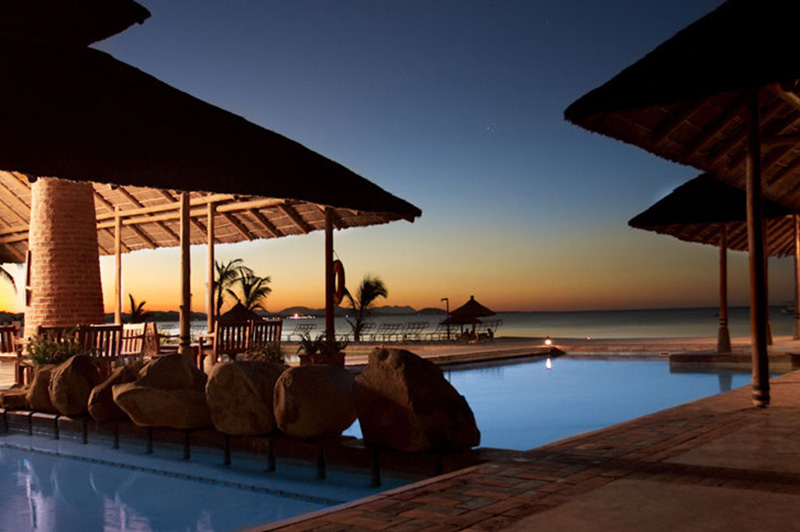 Mumbo Island and The Makokola Retreat (formerly Club Makokola) are not only geographical neighbours that lie just one hour’s drive apart, but have also long shared an ethos of providing guests with the best Lake Malawi has to offer. The Makokola Retreat has been revitalized with the addition of a world-class spa and a golf course along with many other upgrades, and its magical natural gardens remain a haven of rest and relaxation. On Mumbo Island the combination of iconic natural beauty and the remoteness, exclusivity and tranquility of the island is food for the soul. So if you are feeling jaded, get smart and let six days of escape to these two grand ladies of the lake teach you the three R’s: Relax, Revitalise and Rejuvenate. Experience excellent trail riding through remote Africa, then refresh and relax on Lake Malawi’s best tropical island! Malawians are a nation of bikers, their humble one-gear bikes serve as personal transport, freight-carriers and ‘the family car’. Footpaths, back roads and bike trails criss-cross the rural landscape, presenting the intrepid mountain-biker with unbeatable access to a safe yet very real piece of Africa and its people. The biking route meanders across the Central African Plateau before dropping down into the Great Rift Valley. Almost all the riding is off-tarmac; cars are virtually non-existent on the chosen route, distances are challenging but reasonable, and no technical expertise is required. The bike ride ends on the beach at Cape Maclear. 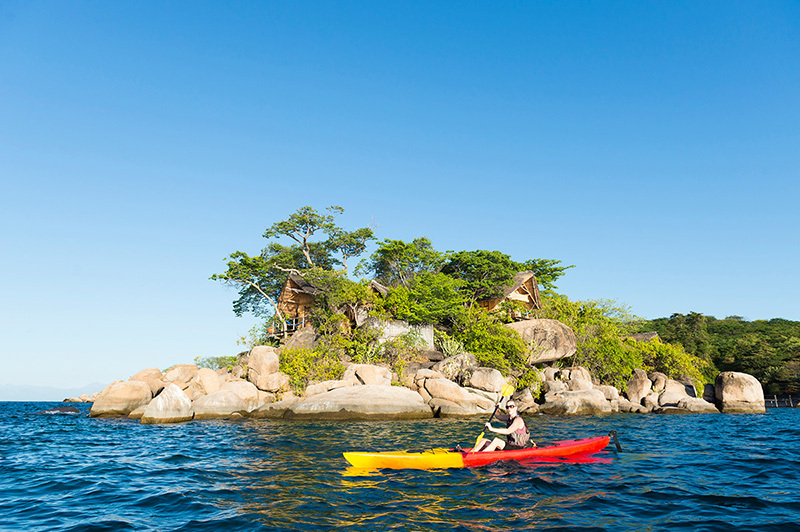 Here you leave the dust and bustle of mainland Africa behind as you embark for the Kayak Africa camp on Mumbo Island. On Mumbo Island barefoot luxury is the theme; there is everything you need and nothing that you don’t. The camp is built using only reeds, timber, thatch and canvas and the emphasis is on the beauty provided by Mother Nature. For the sporty there is sea kayaking, snorkeling, swimming, SCUBA diving or walks through the stunning island forest. Or simply flop into a shady hammock and just ‘time-out’. Kayak Africa’s bike-kayak safaris are fully-supported and catered. Participants focus on the riding and kayaking, while a trusty support vehicle/boat follows behind with camping gear, cold drinks, food and chef on board. Price includes: airfares ex Johannesburg (including all taxes), all road and boat transfers and vehicle/boat support, all accommodation, all meals, all kayaking activity and equipment, all National Park fees and taxes. Price excludes bicycles – participants must provide their own bikes. Price excludes: all items on the Personal Gear List, drinks, travel insurance, and visa fees (no visa needed for RSA residents). Level of difficulty: moderate (biking fitness or experience required; vehicle support is available for those unable or unwilling to ride further). Group size: four to ten people; individual travellers welcome. Options: get yourself there; add or remove nights; spend some time on Domwe Island; add some SCUBA diving; add on other destinations in Malawi. Departure dates: any day of the week. Departure point: OR Tambo International Airport, Johannesburg. Finish point: OR Tambo International Airport, Johannesburg. These trips are activity-orientated, camping trips for the outdoor enthusiast. The biking/kayaking group is accompanied by guides and vehicle/boat support. The vehicles/boats carry the camp equipment and provisions necessary to ensure an adequate level of comfort, and provide backup to the bikers/kayakers in the event of illness, injury, tiredness or an emergency. Kayak Africa’s guide team prepares all meals and takes care of all camp chores while guests chill and soak up the atmosphere. These trips are for the adventurous of spirit – the route and itinerary may have to change due to weather and other conditions of the day. These trips are suitable for any active person in good health. Participants need not be super-fit or experienced mountain bikers or kayakers, but some fitness always enhances one’s appreciation of the experience. Being in good shape is more important than experience – the route does not require any technical mountain biking or kayaking expertise. Lake Malawi lies in the tropics and therefore presents a malaria risk. However malaria is totally preventable through the proper use of prophylactics and avoidance of being bitten (using repellent from dusk, and sleeping in a tent or under a net). Other health considerations are confined to treating and preventing infection of minor cuts and scrapes, and preventing sunburn. A comprehensive medical kit is part of our equipment, and our guides are trained in first aid. We provide purified drinking water, and maintain a high standard of camp hygiene. Kayak Africa offers appropriate travel insurance, and has a comprehensive emergency plan. Satellite phone communications enable contact with homebase and emergency call centres in the event of any emergency situation. Kayak Africa provides all specialised equipment, including all boating, kayaking, camping and catering gear. Participants must provide their own bikes, as well as all items of a personal nature, including bedding, clothing and toiletries. Kayak Africa will furnish you with a recommended Personal Gear List at the appropriate time. With the best multi-day sea kayaking in Southern Africa on offer, this is an opportunity for adventurers and outdoor enthusiasts to get wet, get active, and get out there! Covering 60km in four days of paddling, the route has it all: secluded bays, deserted islands, mile-long beaches and open-water crossings. Not to mention the warm, clean and endless waters of the world’s fourth largest lake. Or the fish eagles, the tropical fish and the forested mountains that form the rim of the African Rift Valley. Days will be spent paddling, swimming, snorkeling and generally working up an appetite. Overnight stops are at a variety of lodges and campsites along the way. Kayak Africa will provide all logistics including guides, support boat, kayaking and camp equipment. And of course delicious meals and cold drinks! Participants provide a love of the outdoors and a willingness to achieve something special. Day 1: Flight from Johannesburg to Lilongwe. Kayak Africa airport pick-up, then scenic road transfer to the southern lakeshore. Overnight at Nanchengwa Lodge. Day 2: After a familiarisation and safety briefing on the beach, hit the water for the 22km to Chirombo Bay near Monkey Bay. Overnight at Chirombo Bay. Day 3: A 20km paddle past Monkey Bay and the mountains of the Nankumba Peninsula en route to Domwe Island in the Lake Malawi National Park. Overnight in Domwe Island Camp. Day 4: An introduction to the open water with a relatively short 8km paddle to Mumbo Island, also in the Lake Malawi National Park. Overnight in Mumbo Island Camp. Day 5: A rest day spent on Mumbo Island. Overnight in Mumbo Island Camp. Day 6: After a leisurely morning and lunch on Mumbo Island, kayak the final leg of 10km to the beach at Cape Maclear. Overnight in Gecko Lounge at Cape Maclear. Day 7: Road transfer to Lilongwe airport for your return flight back to Johannesburg. Price includes: airfares ex Johannesburg (including all taxes), road and boat transfers and vehicle/boat support, accommodation, all meals, all kayaking activities and equipment, and all National Park fees and taxes. Level of difficulty: moderate to strenuous (reasonable fitness required, some experience a plus; boat support is available for those unable or unwilling to paddle). Group size: six to ten people; individual travellers welcome. These trips are activity-orientated, camping trips for the outdoor enthusiast. The paddling group is accompanied by guides and supported by a motorised boat and land crew. The boat and land crew carry the equipment and provisions necessary to ensure an adequate level of comfort, and provide backup to the paddlers in the event of illness, injury, tiredness or an emergency. Kayak Africa’s guide team prepares all meals and takes care of all camp chores while guests chill and soak up the atmosphere. These trips are suitable for any active person in good health. Participants need not be super-fit or experienced kayakers, but some fitness always enhances one’s appreciation of the experience. Being in good shape is more important than paddling experience – sea kayaking is like hiking, but using kayak and paddle instead of feet and back. Its physical, but the pace is about the same. Kayak Africa provides all specialised equipment, including all boating, kayaking, camping and catering gear. Participants provide all items of a personal nature, including bedding, clothing and toiletries. Kayak Africa will furnish you with a recommended equipment list at the appropriate time.